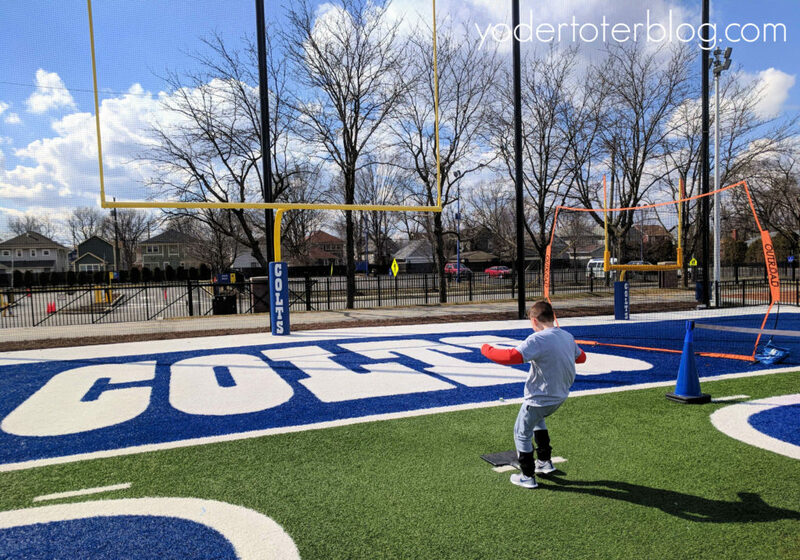 Indy is a great city for families! This Midwest mecca holds the World’s Largest Children’s Museum & other great sites! 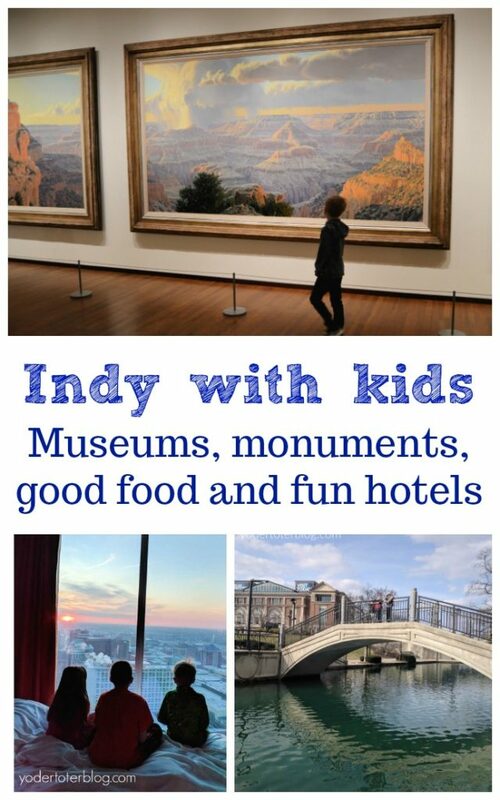 Here’s my guide to kid-friendly things to do in Indianapolis. At nearly 500,000 square feet in size, it’s easy to see how the Children’s Museum of Indianapolis hosts 1.25 million visitors each year! The Children’s Museum of Indianapolis is very popular with families. 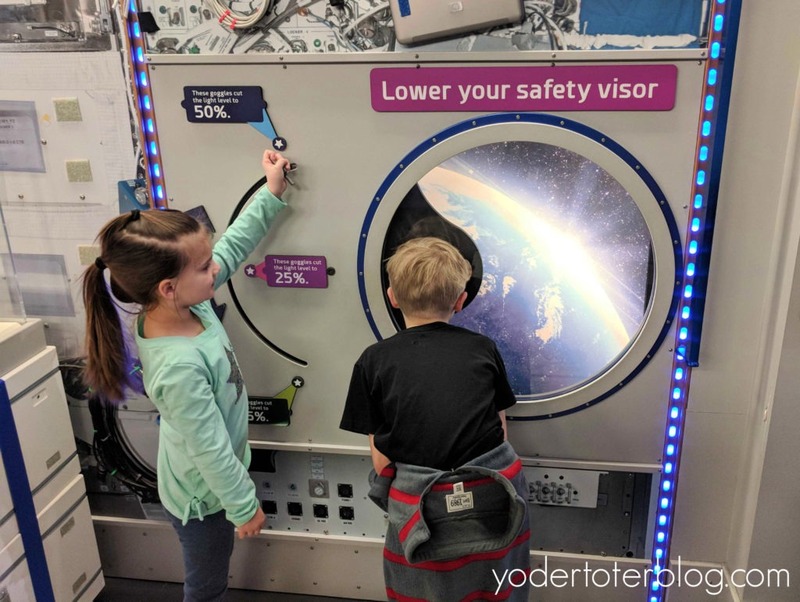 After all, this isn’t your typical children’s museum- it’s an inter-generational learning environment that caters to everyone from the very young to the very old. The museum is HUGE, which makes it impossible to see in one day, and the average is 6 new exhibits every year! Your family could visit time and time again and still have a new experience! My kids’ favorite part of the Children’s Museum was actually outdoors! The 7+ acre Riley Children’s Health Sports Experience offers a slew of sporting experiences for all ages! They can practice their shot on the Pacer’s court, or pretend they are one of Indianapolis Speedway’s fastest by pedaling a race car! There’s no shortage of things to new things for kids to do! You can read more about our favorite, can’t-miss experiences HERE. For pricing and exhibits, visit the Children’s Museum of Indianapolis website. 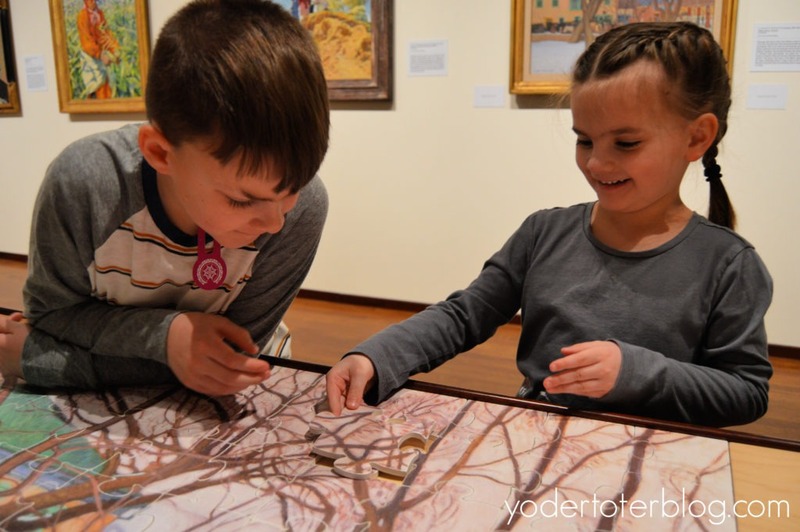 One of two museums east of the Mississippi to explore Native American culture, the Eiteljorg Museum surprised me with its host of kid-friendly activities! Throughout the museum are interactive displays that allow little hands to touch and learn. In the Art of the American West Gallery, located on the first floor, children have an “Elements of Art Studio” dedicated solely to them, In this space, children can work on creating a landscape, blending colors, working with textures, and more! Our family’s favorite part of the gallery was doing a puzzle based on a piece of art! 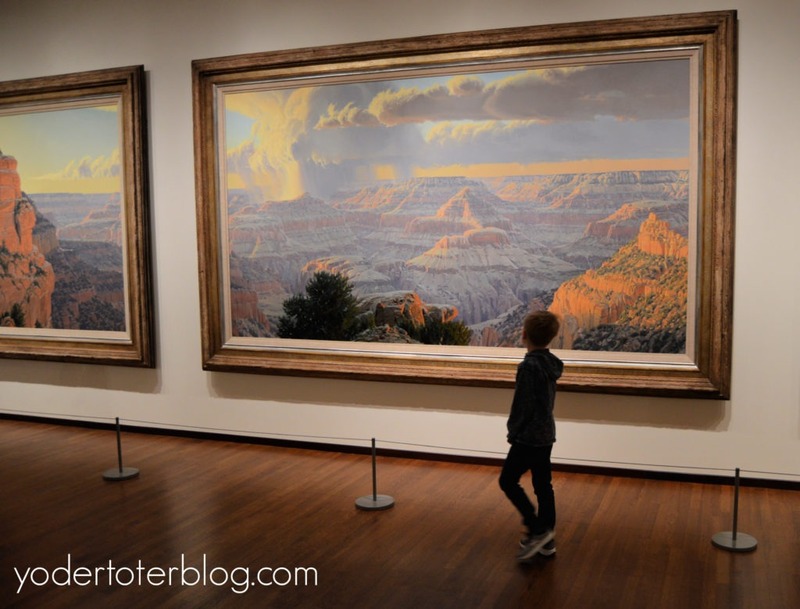 Now, that’s a way to get children to study art! The Eiteljorg’s public space in the basement is devoted to playing! Children can design a totem pole based on their family story and then learn about Native Americans and western settlers. It was difficult to pull the children away from this area! When visiting, make sure you ask about an admission discount for military, AAA, or for staying in a downtown hotel. 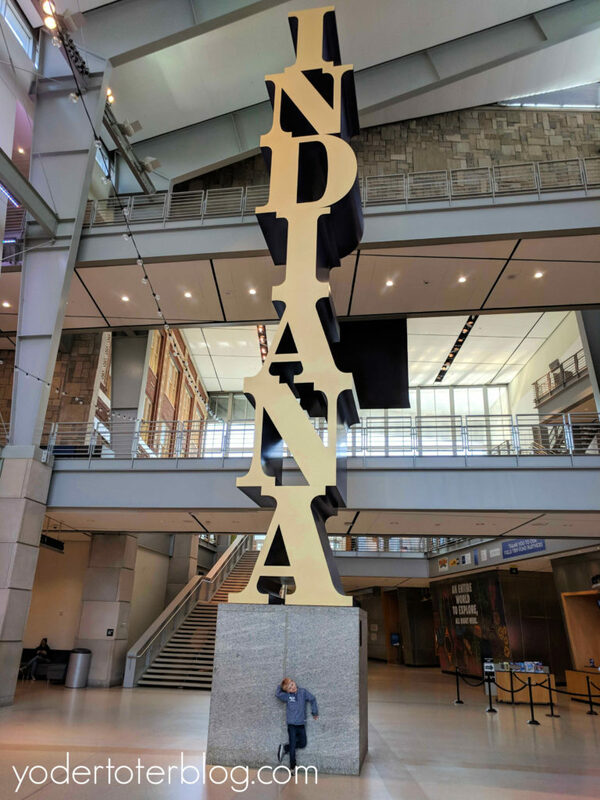 Not sure if it makes me a traitor, but I really loved the Indiana State Museum (BUT I have yet to visit Ohio’s History Museum). The Indiana State Museum has 3 floors of interactive displays for young and old. Families learn about the state of Indiana’s Natural History from the Ice Age until Modern Day, and each exhibit offers something to find, touch, or smell, keeping even the youngest travelers engaged. One of the more notable exhibits was the pendulum. 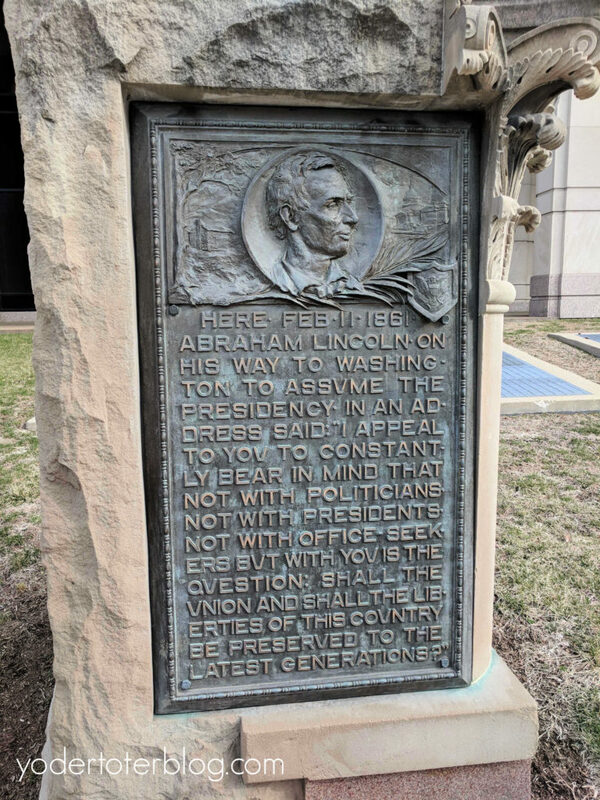 The kids would have been happy to stand and stare at it for hours. (Also, how do I get one of these installed in my house)? And, all of us had fun watching the video of famous movie stars and athletes born in Indiana. Everyone found someone with whom they could relate! One of the seasonal exhibits is Color of Style. 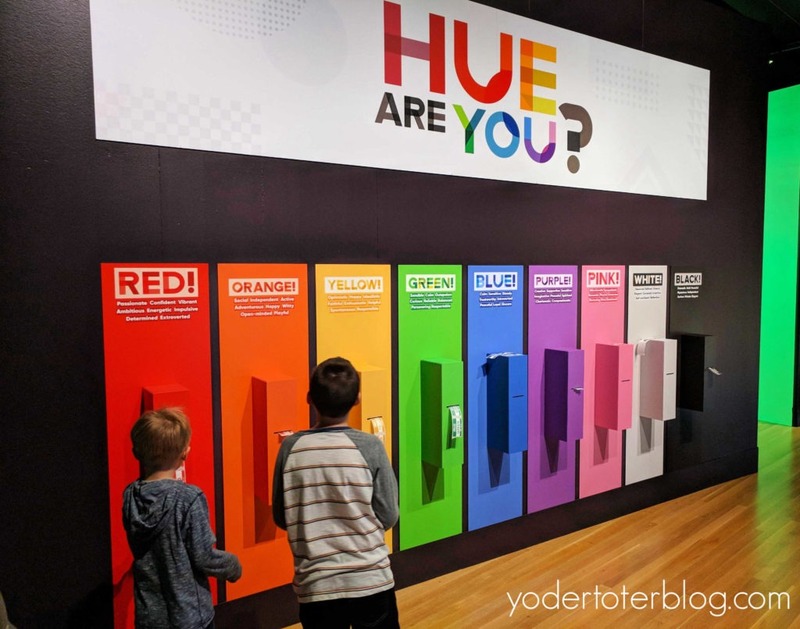 We loved the portion, “Hue are You?” with screens allowing us to pick the color that best suited our personalities. The experience showcases outfits from the 1800s through today, with features by Hoosier designer, Bill Blass. The Color of Style is on display until July 28 and is included in Museum admission. Indianapolis has two treasures that should not be overlooked – and they conveniently pass right through downtown. The Central Canal was authorized in 1836 by an Internal Improvement Act, but after Indiana’s state bankruptcy in 1839, the canal, meant to link with the Erie Canal and Ohio River, was never completed. Since then, the canal has been used for hydraulic power, fresh water, and recreation! If nothing else, it’s a gorgeous place to take an afternoon stroll. I’m only sad we weren’t visiting during the summer to take a gondola ride. The National Road, or US-40, also passes right through Indy! We enjoyed reading the markers and considering how Abraham Lincoln would have traveled this same road. Along US-40 travelers will also see Indiana Statehouse. We didn’t have time to take an inside tour, but we did marvel at the building. Lucas Oil Stadium was built in downtown Indianapolis in 2008. It took three years to build and cost nearly $720 million dollars. For football fans and those who enjoy construction, it’s worth taking a tour to appreciate the structure! 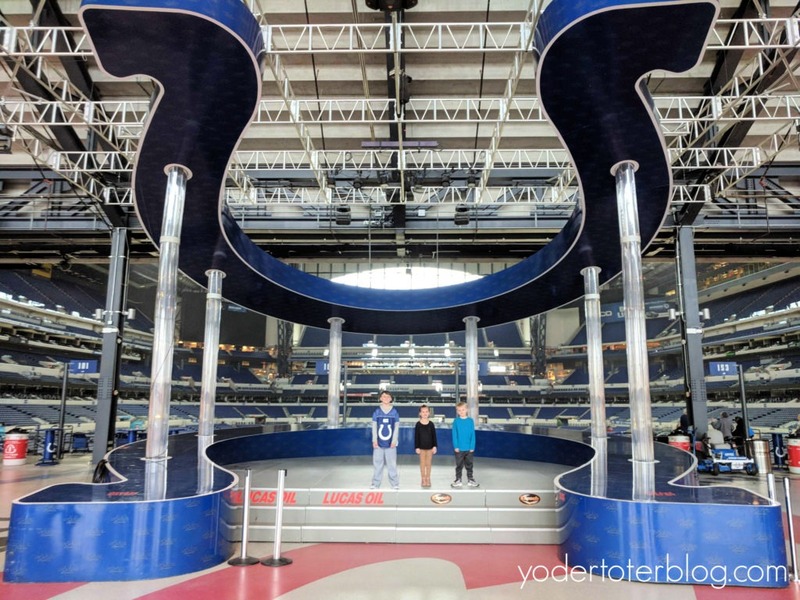 The Lucas Oil Stadium tour lasts about 90-minutes and is kid-friendly and can be wheelchair/stroller-friendly. Those visiting Lucas Oil Stadium get access to the press box, lounge, home locker room, and the field. However, field access does not mean that you’re allowed to bring a ball or play. (Cue weeping and gnashing of teeth from my son). Indianapolis has no shortage of kid-friendly restaurants. Here are a few that we enjoyed. 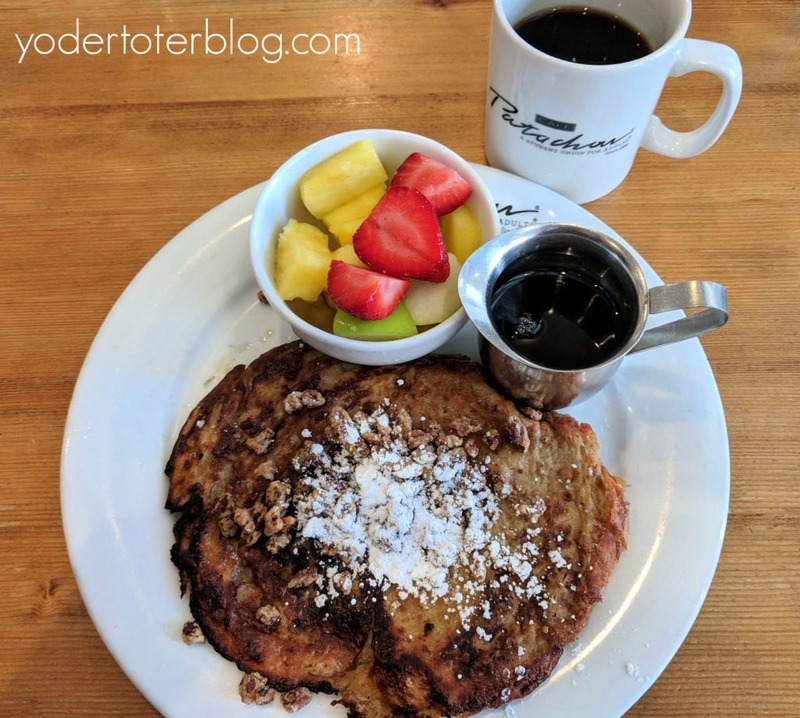 Cafe Patachou – Cafe Patachou brought farm-to-table breakfast and brunch to Indy before it was fashionable and trendy. You’ll find plenty of selections, fresh serve-yourself coffee, and a kid’s menu. Don’t miss this one! Burger Study – All types of burgers and appetizers, located close to Bankers Life Fieldhouse or Lucas Oil Stadium. Try the fried cauliflower appetizer. My littles said they “hated cauliflower,” then proceeded to eat half of it! They do have a great kids’ menu and also give out a packet of things for kids to do while you wait. Pearl Street Pizzeria & Pub – No kids’ menu, but pizza is easy enough and they also have a baked macaroni dish. Convenient downtown location, seating is limited so get here early. Rock Bottom Restaurant and Brewery – Our favorite dining experience came in the most unexpected way – a brewery! Affordable kids’ menu and quick service! 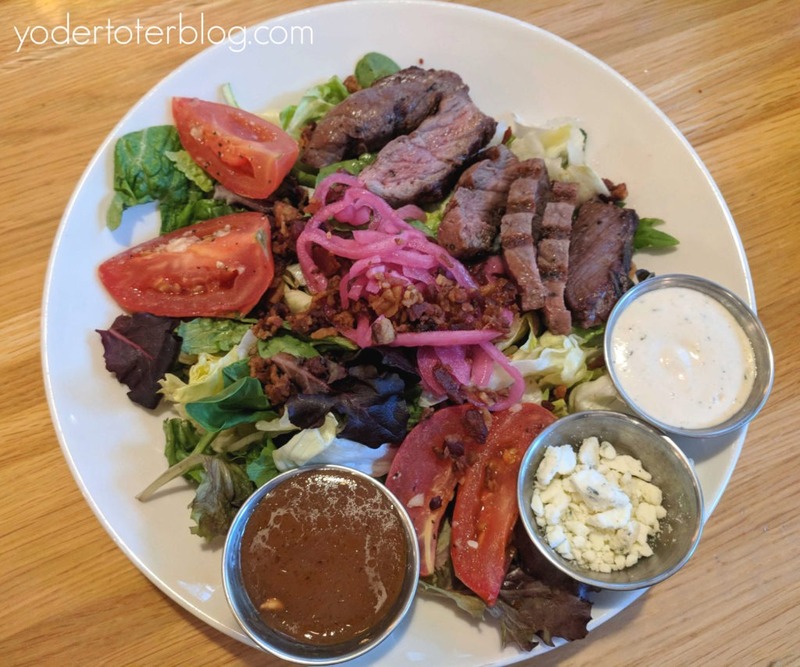 Steak salad from Rock Bottom Brewery & Restaurant. Yummy! For extraordinary service and views, you can’t go wrong with the J.W. Marriott. It’s also just across the street from the Indiana State Museum and the Eiteljorg Museum. For the best views, pick a high floor. These rooms are probably best for families of 4 or smaller – would be great for a mother/daughter getaway, too! Check rates HERE. Looking for unique accommodation? Try a train car room at Crowne Plaza Downtown Indy. This hotel is part of the former Union Station and allows you to sleep on a train that’s parked inside the hotel! Check rates HERE. 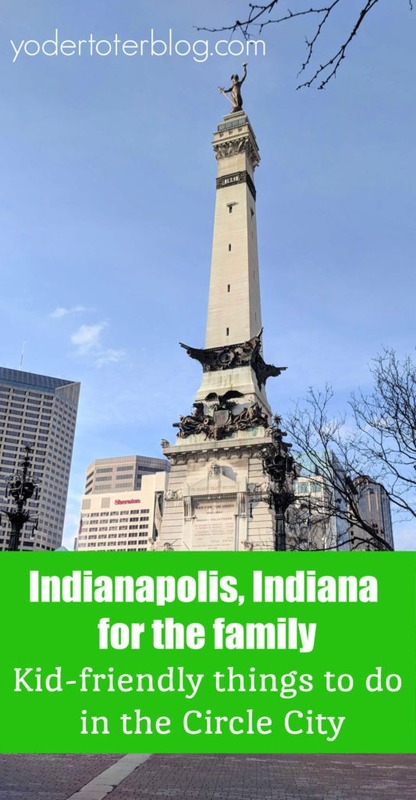 Have you been to Indianapolis? What kind of kid-friendly activities do you recommend?